DownloaderXL Pro is a lightweight add-in designed for MS Excel 2013 and 2010 which enables you to easily download securities' price data into your workbooks. 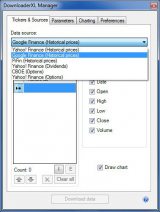 The program is able to offer quotes from a wide range of data sources, including Google Finance, Yahoo! Finance, CBOE, PiFin, and more. The application lets you obtain historical monthly, weekly and daily prices for indices, stock and mutual funds, historical dividend data, historical end-of-day data for commodity futures, financial futures, currency FX rates, and indices, and more. DownloaderXL Pro offers advanced charting functions which will help you effortlessly generate line, bar and candlestick charts from the downloaded data. Trendline and Moving Average functions are offered for basic chart analysis. DownloaderXL Pro comes with a straightforward and intuitive interface which enables you to easily obtain all your needed information. The program give you the possibility to download data and create charts for multiple tickers with just one mouse click. The application allows you to adjust several options according to your needs. The application lets you download data from various sources. The program can be customized according to your needs. DownloaderXL has been tested by Download82.com team against viruses, spyware, adware, trojan, backdoors and was found to be 100% clean. Our editors will recheck this software periodically to assure that it remains clean.